Alina Cohen is a Brooklyn-based freelance writer who covers art and books. Get in touch through email: [email protected], Instagram: alinacohen, Twitter: @alinacohen. Kundera trying out humor in his dotage? Urdu, Punjabi, Pashto, even English, but “Pakistani”? Surely there’s some subtly layered joke in there about stereotyping, post-colonial angst, and racial tensions in France that is flying way above my American radar. A dude named Caliban picking up Parisian chicks by speaking Pakistani? Hilarious. Right? Thanks for the honest review. It helped me get past that point where I feel nearly obligated to read it since Kundera wrote it. Nearly. You were born after the fall of the Berlin Wall? My goodness. That might color (as you admit) your view of the proceedings. 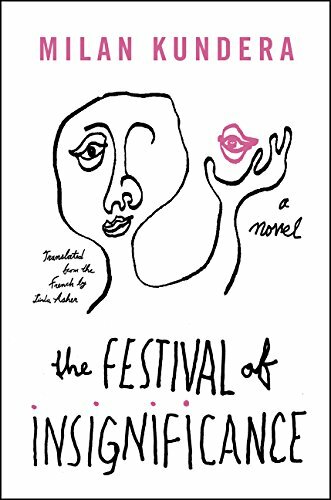 I can only imagine the horror and fascination with which Kundera at his age must view the up-and-coming generation. As a man in my early 30s even I have a hard time engaging with people less than ten years my junior. It isn’t simply that our vernaculars or cultural references are different; it’s that the millennials are growing up in a fantastical new “me” world. I understand that’s a familiar refrain from generation to generation. But I do think there’s something markedly different about this new world, this post-Berlin Wall world, if you will. The internet and smart phones / cameras have become less a way to access information than a form of production. They are primarily now tools to document and put yourself out into the world. At best this bores me. At worst it makes me uneasy. Sounds like this is minor Kundera either way. But I wouldn’t simply write him off as a crusty old man shaking his fist. Exactly who was the first kid to spread a name or moniker across a cityscape is up for debate, but this book is as close as one will ever get to a definitive answer.